Is Audit u/s 44AB required if turnover is less than one crore and profit is less than 6%/8% for FY 2017-18. Question Bank › Category: Income Tax › Is Audit u/s 44AB required if turnover is less than one crore and profit is less than 6%/8% for FY 2017-18. I am a salaried person and I am also engaged in F&O trading. My Gross total income is 5 Lakhs. Turnover of F&O trading is Rs. 20 Lakhs but my profit from F&O is less than 6% of turnover. I have earned only 50000/- from F&O in FY 2017-18. Can I declare profit less than 6%? Do I need to go for tax audit to declare profit less than limit specified in 44AD. 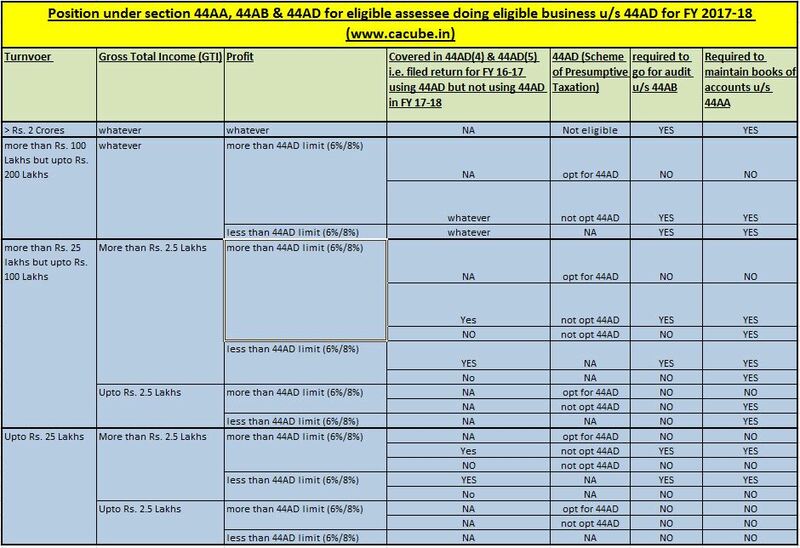 If you did not opt for 44AD in FY 2016-17 then you are not required to go for audit for FY 2017-18, even if your profit is less than limit specified in 44AD i.e. 6%/8%. Therefore, now if business has to come under purview of tax audit, it can come only by way of another sub-section being introduced in the act. So now, audit can only be applicable if provisions of sub0section (4) of Section 44Ad are applicable in case of assesse. Assesse declares profit for any previous year (starting from FY 2016-17) in accordance with provisions of 44AD. He declares profit for any of the five assessment year succeeding this previous year not in accordance with provision of 44AD as he shows less than 8%/6% profit in the succeeding years.